While on tour with his American power trio – supergroup, The Winery Dogs, Mike Portnoy filmed an epic and personalized invite video to his first ever Progressive Nation at Sea Cruise. Taking you band by band and leading you through the musical adventure that attendees have to look forward to at this one of a kind, floating Progressive Rock festival taking place February 2014. “I could not be any prouder or any more excited than I am for Progressive Nation At Sea 2014. It is my ultimate dream lineup ranging from legends like Jon Anderson & Adrian Belew to Prog trailblazers like Spock’s Beard & the Flower Kings to today’s most extreme cutting edge artists like Devin Townsend and Periphery. I am also excited to be playing with Bigelf, PSMS & Transatlantic…the final encore of which will see Transatlantic & Jon Anderson joining forces for a one-time only set of Yes classics! Progressive Nation at Sea, an infusion of music and technique that will heighten your senses in a way no other vacation ever could! Imagine a couple thousand prog enthusiasts surrounding you on the Norwegian Pearl as we set sail from Miami to Great Stirrup Cay and Grand Bahama Island February 18-22, 2014. The cruise is powered by leading Progressive Rock label InsideOut Music and features the genres most prolific artists. This music festival at sea gives you an experience that one on land just can’t match. In addition to 5 days in the beautiful Caribbean, music will be happening from morning till late at night. Some of the best experimental music might be in the wee morning hours in an unscheduled jam by the artists! When you finally call it a night (or a morning) you can head back to your comfortable room and get some rest before getting into the action all over again. Did we mention you’d be walking around the same place as your musical heroes? Oh yeah, that means you might be having dinner and drinks right next to your favorite musician! 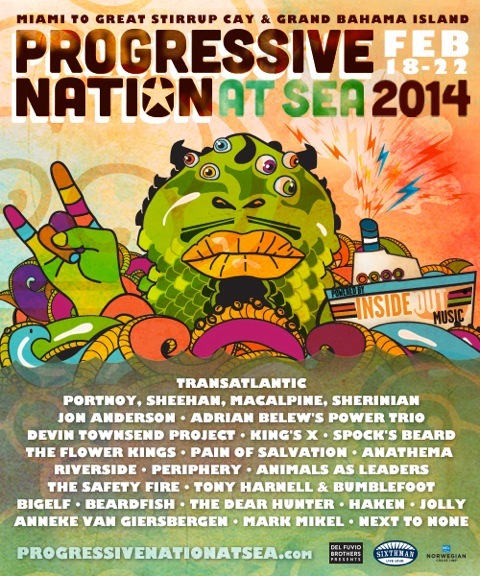 Progressive Nation at Sea boasts the musical genius of Transatlantic, Portnoy, Sheehan, MacAlpine, Sherinian, Jon Anderson, Adrian Belew’s Power Trio, Devin Townsend Project, King’s X, Spock’s Beard, The Flower Kings, Pain Of Salvation, Anathema, Riverside, Periphery, Animals as Leaders, The Safety Fire, Tony Harnell & Bumblefoot, Bigelf, Beardfish, The Dear Hunter, Haken, Jolly, Anneke van Giersbergen, Mark Mikel and Next to None.